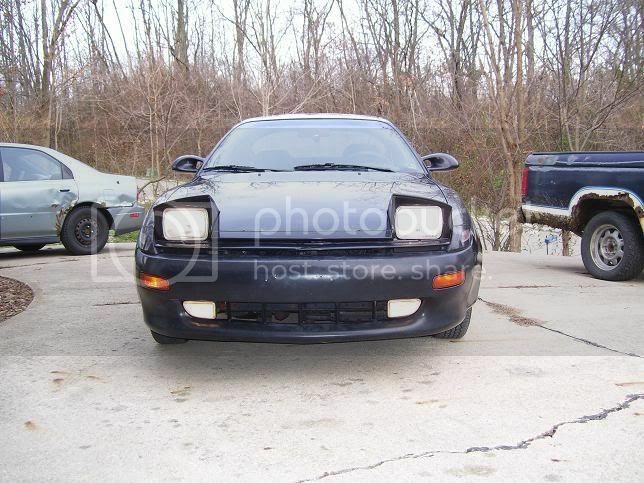 I figured this would be a good guide for anyone who doesnt have fog lights in their celica to know how to convert them rather than start from scratch. 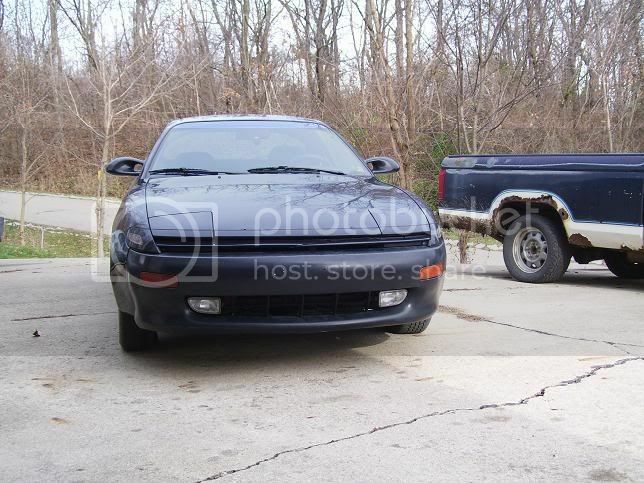 This was done with a 90-91 celica, and due to the bumper style changes of 92-93, I am not sure if they will connect the same way. Same applies for the alltracs, GT-S's, and Carlos Sainz versions. However, the wiring will all be the same, so if nothing else that part will be helpful to all. Well it's simple, and only requires 2 10mm bolts per lamp. If you pull the fog lights or are buying them off of someone, demand they include the bolts with the fog light brackets or you will have to go to a junk yard to get them. 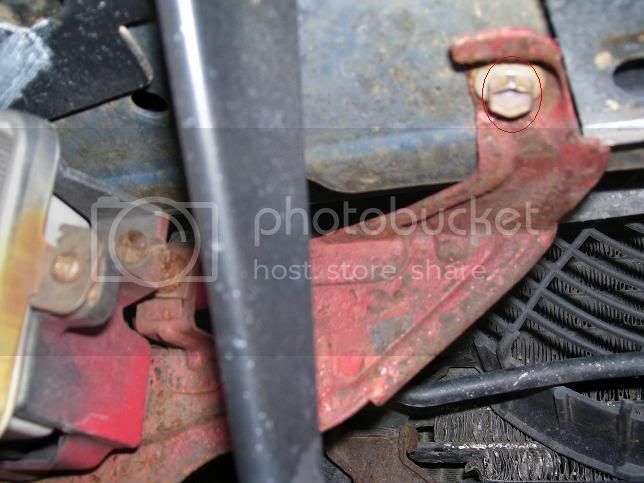 There are also more than just these 4 holes on the actual bumper (metal), however you will be able to tell which ones they are because they are the only holes with a thread in them. 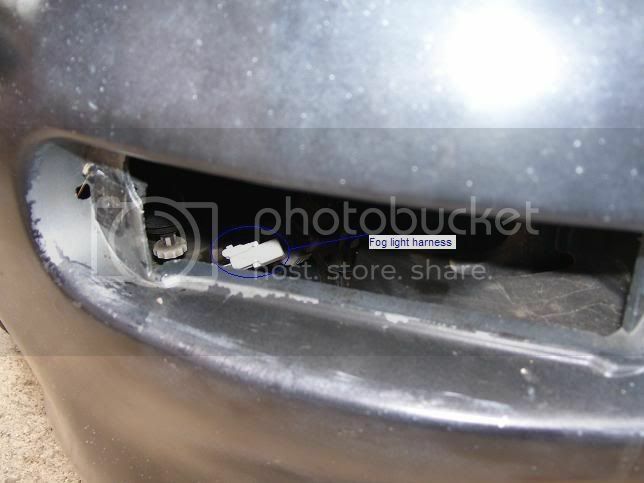 Also, it doesnt require removal of the bumper, just come from underneath it. 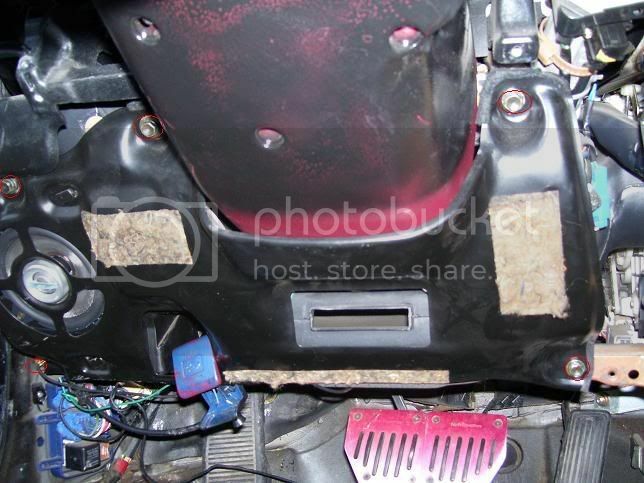 The right hand bolt in the pic is hidden behind the bumper, its a bit of work to get to but possible. The bolt that is half way cut off on the left I took a picture of through the front bumper, it is pretty easy to tell where it is. Now that you have them mounted, lets plug in the lamps. This requires removal of your bumper lantern because the harness is tucked up in the fender and taped to the bumper light harness. It is not hard to get to though, so dont worry. 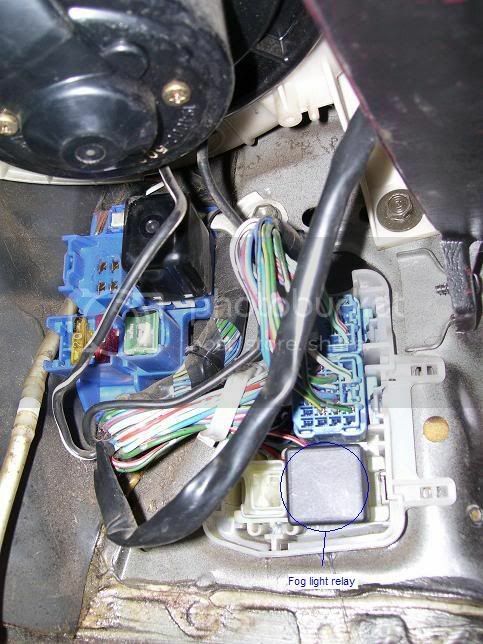 You will most likely have to connect the harness up in this area, so do connect this harness to the fog lamp harness before putting your bumper light back in. Next thing to do now is mount the fog light switch, which will take a good amount of work. 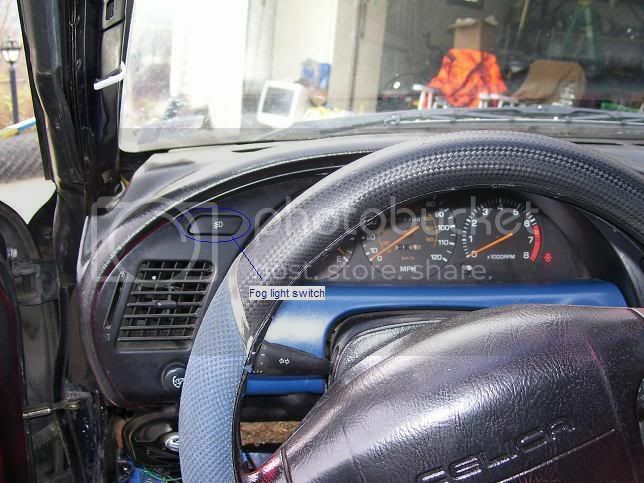 You will need to remove your dash trim, 2 screws are located on the trim above the gauge cluster. 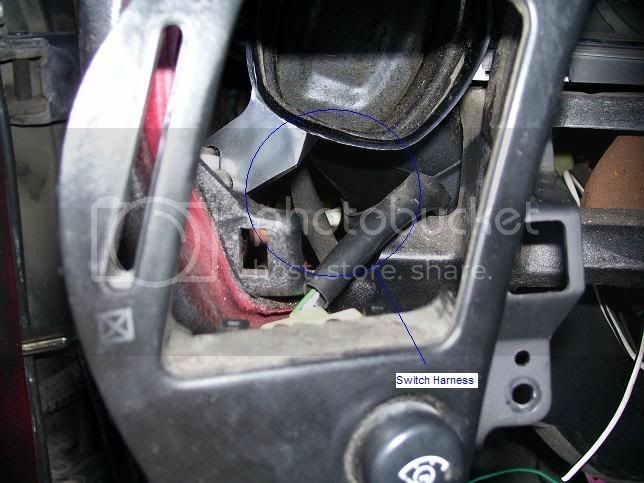 On the piece right above the steering column (blue in the pic), there are 4 screws on the bottom of it. *Note: A lot of my interior is gone, so you will have to do a little bit of extra work than what I am able to list. The knob on the passenger side vent will pop off, but takes a good bit of effort, I believe its glued in but not 100% sure. Also dont worry about getting the HVAC controls off as they will not effect your work. And aha! There it is, hiding under the driver side duct! 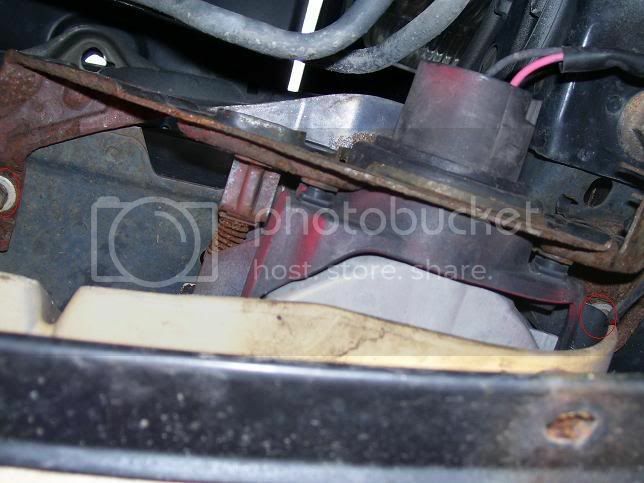 After you find that, pop out the placeholder for the fog light switch. It goes in from the front, so you will need to pop it out towards you by squeezing in the clips from the back. After you do this, you will need to screw in the light switch. 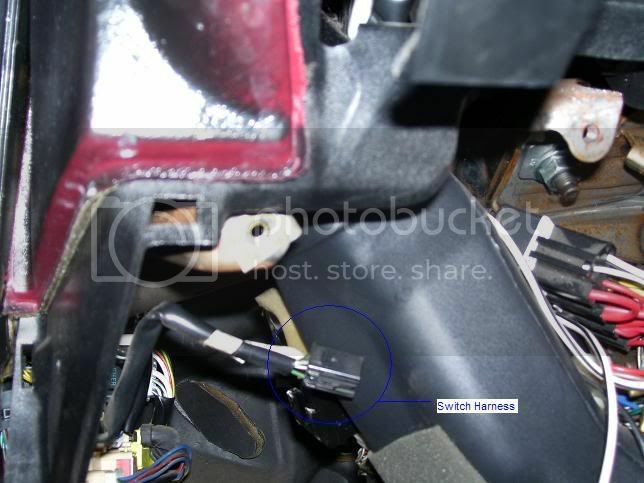 There are alignment rods so have the switch in them before screwing the switch in. They are only about $1.20 for the pack, and they will hold the switch in securely. They can be found in the droors full of bolts, screws and nuts. Now that the hard part is all over, all that is left is inserting the relay. Here is a tip, the relay they recommend is....well I hope you're sitting down...$50-70. But not to worry, I picked up a different kind that worked just as well for $10. It may not be quite as durable, but it gets the job done, and will save you a load of money. I picked it up at autozone, you will need to ask them to get the part, the number is "19456 41-5125". 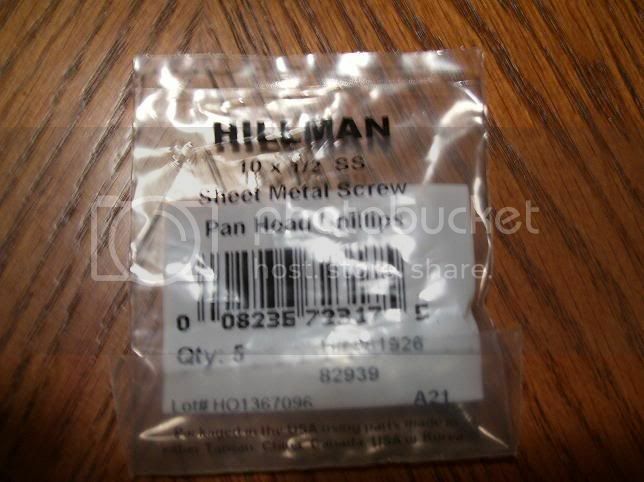 Im not 100% sure, but they may be able to find it with just the 41-5125 part, but you have the whole number that is on the box just in case you need it. If you prefer to have the relay they say you should have but dont want to spend the money, I recommend going to a junk yard. Well thats all there is to it, so now you should have working fog lights! If you go to push the button and nothing happens, do not worry! Remember to turn the ignition on and your lights on, then they will work.